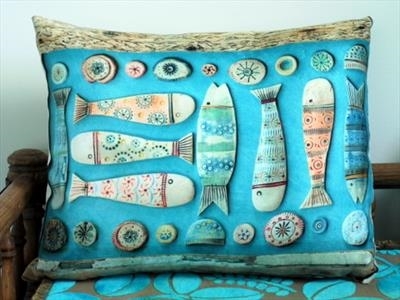 Designed by Shirley Vauvelle with her handmade ceramic components arranged on a vibrant turquoise background and edged in driftwood. Digitally printed onto a very soft faux suede. Machine washable at 30 degrees. This unique cushion includes cushion insert, image printed onto one side edge to edge and zip fastening. Stone coloured faux suede back.